Let go of what you think you know about Black womanhood. 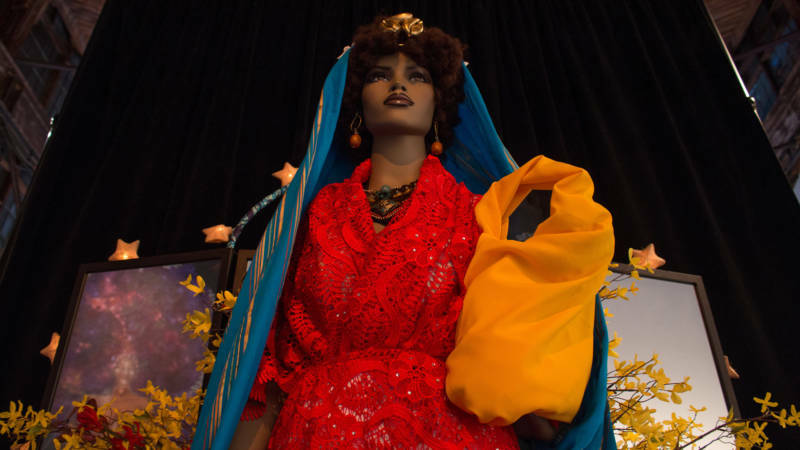 SOMArts’ current exhibit, The Black Woman is God: Reprogramming That God Code takes the viewer on a journey beyond definitions, stereotypes and mainstream media, to a forest of ancestors, politics, goddesses, modernity, prayers and spells. The exhibit doesn’t attempt to define as much as it offers an exploration of the many facets of Black womanhood. 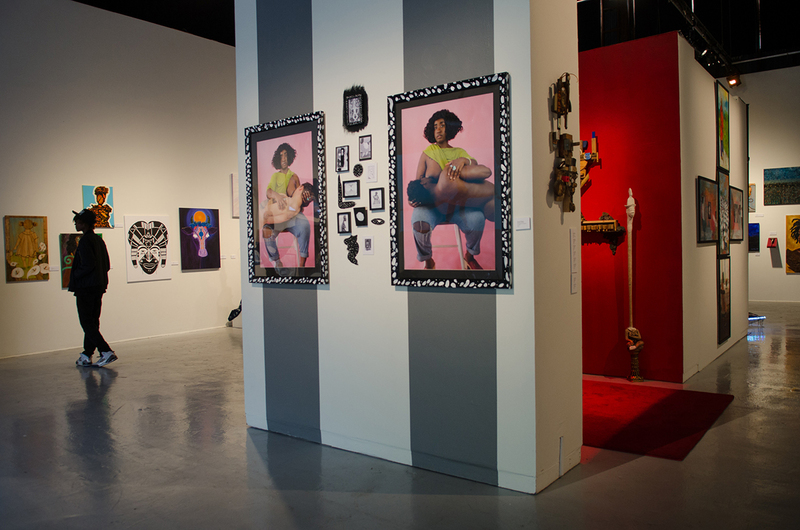 Curated by Karen Seneferu and Melorra Green, the exhibit showcases work across media that helps visitors reexamine Black womanhood, as depicted by Black female artists. With a vast collection from over 60 intergenerational artists, the exhibit guides viewers on what feels like a spiritual journey through imagery and installations that celebrate the Black woman and her contributions to the world. It’s a far too rare experience to see art focusing on Black women that communicates the diversity of Black identity, spirituality and expressions of womanhood. Black Woman is God avoids oversimplification and generalizations in a full range of pieces that pay homage to ancestors, West African spiritual practices, the mysticism of the Black womb and modern portrayals of Black women. Delve into interactive pieces like ComPAIRative Analysis, an installation by twin artists Taiwo and Kehinde that explores divine twinhood in Yoruban culture, complete with an altar. Examine the weight and burden of stereotypes in Yetunde Olagbaju’s provocative treatment of the "mammy" trope in MAMMY, MAMMY, photographs depicting a contemporary Black woman breastfeeding adult men amidst imagery of Aunt Jemima. Marvel at Nye’ Lyn Tho’s captivating photography and graphic design depicting the legacy of slavery, Black women’s contributions and sacrifices in Cash Crop. Although the positioning of the pieces within the exhibition at times felt overwhelming, individual works still gave me pause. Alice Eastgate’s painting Freed-a is a beautiful pop of modernity and color that seamlessly honors Frida Kahlo, Black womanhood and mysticism in an exquisite mix of patterns. 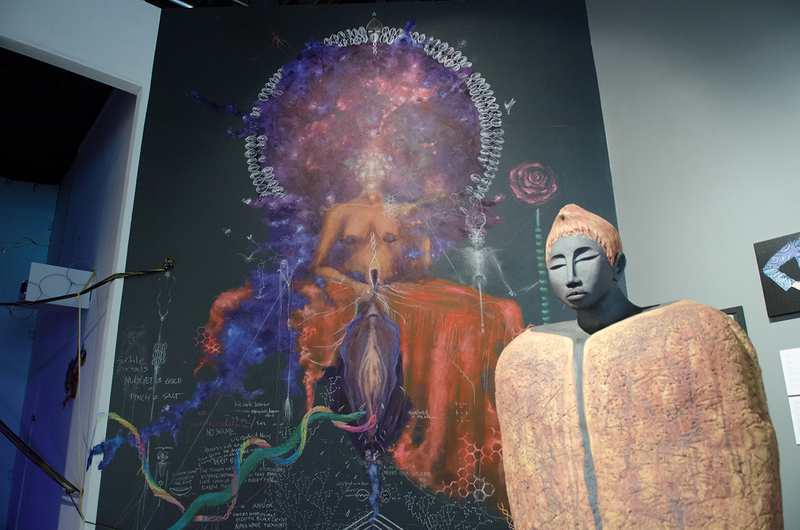 Make sure you have plenty of time to fully take in Sage Stargate’s Ancestral Womb Portal Mural, a massive chalk mural capturing the mysticism of the womb, complete with hopes and incantations. 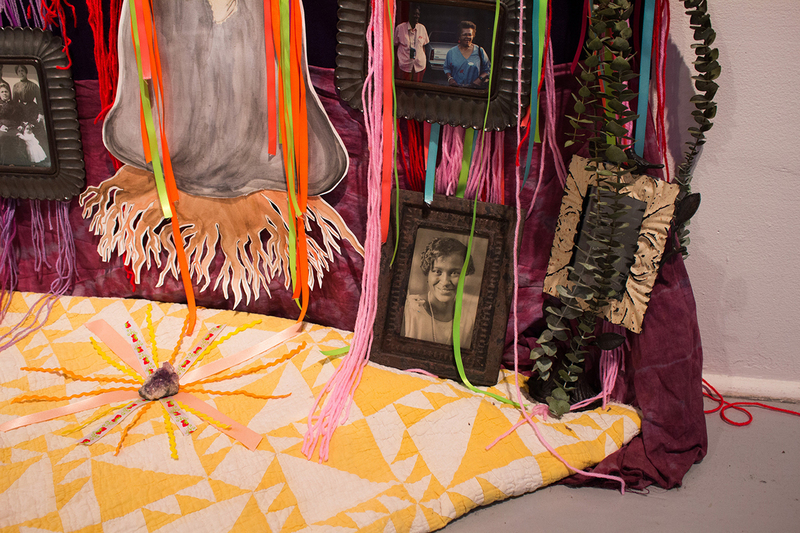 Similarly, House of Malico’s Rites of Passage Project needs ample time; a full room is dedicated to the piece, exploring the process of entering womanhood with video, sculpture and installation. Both of these experiences are so engrossing, you might momentarily forget where you are. The question posed to exhibition visitors by the curators is, “When Black women create, are they God?” The works demonstrate the majesty and power of the Black woman in a way that also completely demonstrates her humanity, realness, vulnerability and complexity. In an art scene that often ignores Black women, Black Woman is God is much needed. It seeks to fill a void where expressions of “femininity” and “Blackness” often leave out the very intersection of those identities. Regardless of who you are, a trip to Black Woman Is God will pull you closer to examining your own divinity as well. 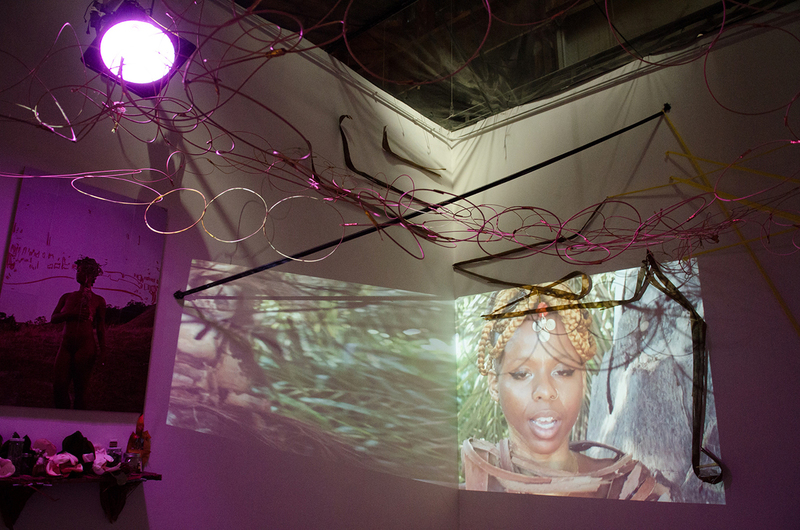 The Black Woman is God: Reprogramming That God Code is on view at SOMArts in San Francisco through Aug. 17. Visit somarts.org for more information.